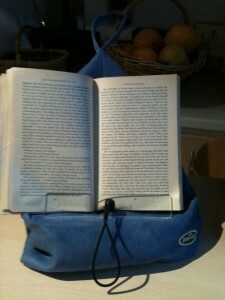 I love nifty things so was delighted when Thoughtful gave me The Book Seat for my birthday. And he was even more delighted to tell me it’s an Australian invention! Perfect for reading while I’m having breakfast or lunch by myself! 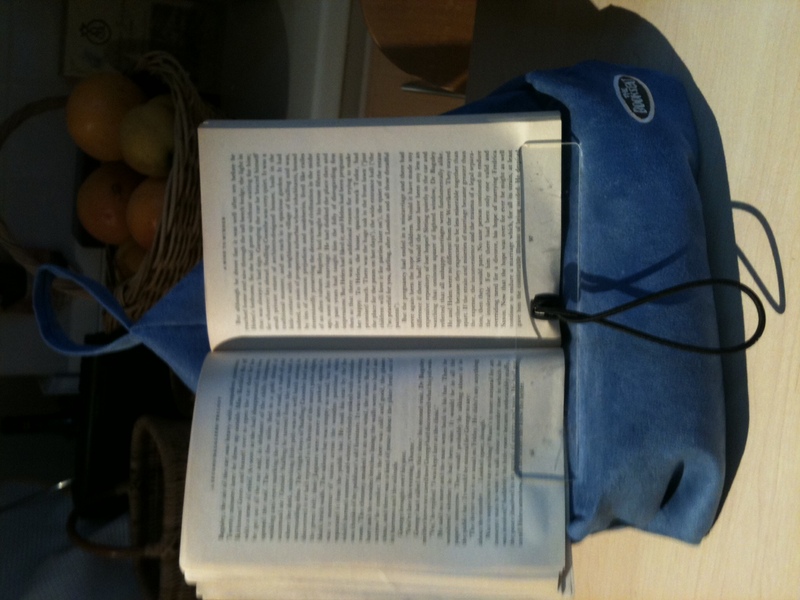 I can also use it to hold up a cookbook. And while we’re in the kitchen, I’ve discovered that no matter how much you pay for a toaster, you still don’t get perfect toast each time – and I am very fussy about my toast! So I always make sure that the toaster has a large “stop” button so that you can make it pop up immediately if you suspect it’s getting too brown. The other day, I suddenly saw smouldering and the next minute little flames were jumping up because I’d overlapped two pieces. Unfortunately my toaster isn’t quite wide enough to take two pieces of my homemade bread side by side. 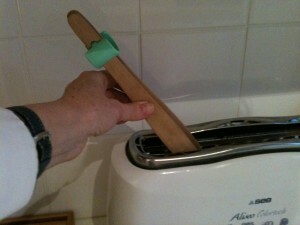 So these toast tongs often come in handy! I just love this little guy. 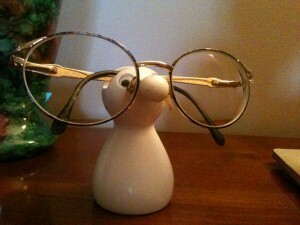 One of the things that used to disappear and reappear regularly were my glasses. I only wear them to watch TV when I’ve taken out my contacts so you’d wonder why I can’t put them back in the case each time. I guess it’s just my natural messiness. Having such a nifty little guy to look after them is perfect. Now I can always find them. The little guy comes in all sorts of colours and I bought them in La Chaise Longue in rue Croix des Petits Champs. 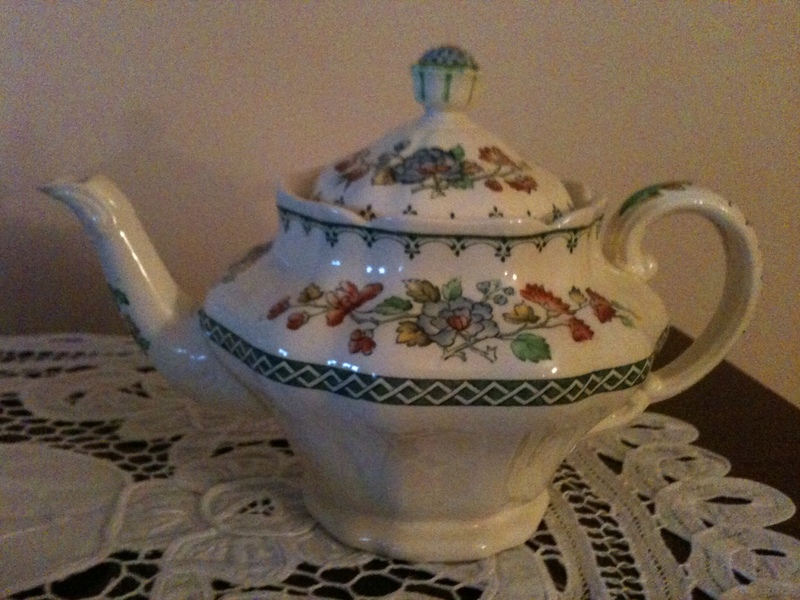 Now study the spout on this teapot made by Spode in England that I inherited from my mother. It doesn’t drip. Unfortunately it only makes one cuppa and I’m definitely a multi-cuppa tea drinker. Now take a look at this one from Gien in France. You can see that the spout doesn’t have a sharp edge and it’s tilted in a different way. 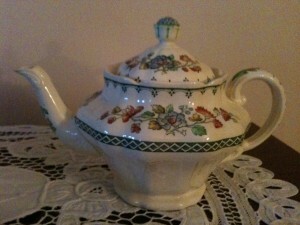 My experience with French teapots is that they all drip. 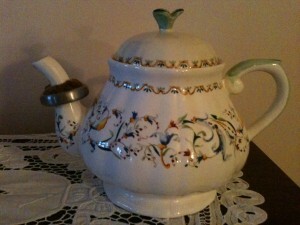 I don’t understand why they don’t just copy the spouts on English teapots! One day, I decided I was going to solve the problem so looked up the Internet and found several drip stoppers, but none of them matched my teapot and certainly not the red Ladybug Tea Drip Catcher or the one that looks like a slice of orange with a hole in the middle. But I was convinced that something suitable must exist somewhere so last Christmas when we went shopping in Rouen, I went into every likely shop. The shop assistants looked at me blankly. Then finally, a woman said, “They’re over here” and there they were, admittedly not the most attractive thing around, but still discreet enough (well, I’ll let you judge for yourself) to make my teapot usable again. We went back this Christmas to get some more and, would you believe it, we couldn’t find the shop again! If you want to know more about why teapots drip, you can read all about it here. So what are your favourite nifty inventions? Don’t forget to subscribe to new posts – that way you’ll get them directly on your smart phone or in your mail box! This entry was posted in French customs, Lifestyle and tagged Gien, glasses holders, Spode, teapot drip catcher, teapots, The Book Set, toast tongs. Bookmark the permalink.